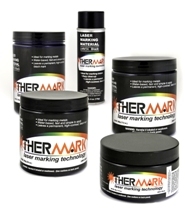 TherMark's patented laser bonding technology offers a unique solution for creating permanent, high contrast, high resolution marks on a wide variety of surfaces, including most metals, ceramic, glass and many plastics. These materials have been individually scientifically formulated for the best permanent chemical bonds possible. TherMark materials are easy to use: simply apply them to the surface to be marked, put the coated part under a laser, laser mark the pattern you wish applied and then remove the excess material.